How to Design for Testability (DFT) for Today’s Boards and Systems | A.T.E. (Advanced Test Engineering) Solutions, Inc.
DFT is a design discipline that benefits test engineering, manufacturing, logistics, field support and even Marketing. In addition to overall quality improvement and more reliable end products, a major benefit of DFT is earlier time to market, and that is a major concern of all managers. Anyone who can influence or be influenced by DFT will find this tutorial beneficial. • Author: Louis Y. Ungar, President, A.T.E. Solutions, Inc. This web based course is a detailed review of the various guidelines covered in the SMTA/TMAG Testability Guidelines. Part 1 introduces the issues surrounding testing of electronic circuit boards and systems. It details the testing concept and the mix of testers normally used. This includes the JTAG/IEEE-1149.1 boundary scan as well as built-in self-test (BIST). With a combination of these technologies, the idea of non-intrusive board (and system) test is explored. The tutorial takes the view that DFT is the best way to improve test performance and cost effectiveness. Towards that end Part 2 provides specific DFT guidelines. It concludes with exploring new standards and developments in DFT that will improve testing of boards and systems in the future. 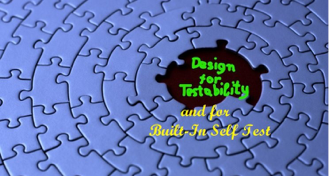 • Design for Testability: What, Why, How, Who and most importantly When? Detailed review of the various guidelines covered in the SMTA/TMAG Testability Guidelines. Louis Y. Ungar enjoys a well-known reputation in the electronics testing profession. He has built, programmed, and selected Automatic Test Equipment (ATE) for a large number of clients both in the commercial and military community. Having introduced the first university course on Automatic Testing and Design for Testability at UCLA, he and his company have taught similar courses to thousands around the world in publicly held forums, at company facilities and online. He has served on international standards committees, such as the IEEE. He led the Surface Mount Technology Association (SMTA) Testability Committee to publish the SMTA Testability Guidelines in 2002 and helped in the project to revise it several times since. He has helped develop an economic modeling tool, called The Test Flow Simulator and a testability management tool, called The Testability Director.